Does your back hurt after a long, stressful day at the office? Are you looking for a safer, more interesting way to exercise? The Hang-Ups Inversion Table is a great way to ease tension in the back naturally and is great for stretching and strengthening. If you have never tried inversion therapy, you might be missing out on your best chance to strengthen your back, relieve stress, and help alleviate pain. Just a few minutes each day can increase circulation and revitalize your entire body. The Hang Ups Inversion Table is a freestanding back swing table that smoothly swivels through a wide variety of angles with your body fully supported. The balance is so precise, simple arm movements control the rotation. A tether strap allows you stop the rotation at any angle. The adjustable roller hinges allow you to select the aggressiveness of rotation. The table can lock at 90º for full inversion, takes up very little space and is great for the home or office. By reversing the effects of gravity, inversion helps to stimulate the circulation of blood around the body, bringing oxygen to where it is needed most. Inversion has long been used to relieve back and neck pain by gently stretching the vertebrae using the person's own body weight. As we grow older, and become less physically active, our body shape changes, as internal organs settle under the pull of gravity. As this happens it becomes more difficult for our heart and other internal organs to function efficiently. A regular daily program of inversion helps to offset these effects of age. It is a fact that the average adult loses 1/2" to 5/8" in height each day primarily due to fluid being squeezed out of the spinal discs (this reverses during sleep). Don’t believe us? Just measure your height in the morning and again at night. You will be 1/2" to 5/8" shorter at the end of the day because of the compressive effects of gravity on your spine. Amazing! The inversion table is also an excellent way to exercise. The table can be used for a variety of sit-ups, abdominal curls, twisting and stretching. It's an easy, fun way to improve muscular tone and flexibility. It also strengthens ligaments and increases their flexibility. Hanging upside down may not be the first thing you think of doing when you're feeling stressed or sore, until you actually try it! The Hang Ups Inversion Table is ideal for easing tension in the back and spine, improving circulation, fighting compression fatigue, reducing stress, increasing flexibility, and is great for stretching and strengthening the torso. The Hang Ups Inversion Table allows for the benefits of spinal decompression without trauma to ankles, knees, hips, and joints. The unit helps to better align your back so you sleep better at night. The bottom line is that inverting to relax and stretch the back has real benefits for many people with back pain and for people who place a lot of stress on their backs, either through their work, hobbies, or athletic endeavors. 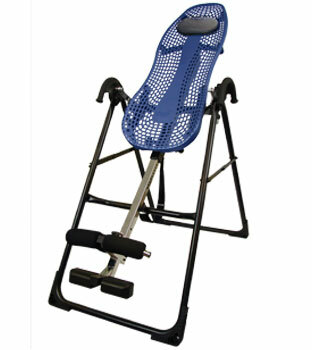 We offer the Teeter Hang Ups Inversion Table. Just step into The Bike Shack, strap yourself on, invert, reduce back pain and feel better! Still in doubt? Try it! The Bike Shack, Hwy 20 @ Cedar Cross Road, Dubuque, IA or phone (563) 582-4381 for more details. The Bike Shack is the right choice for all your fitness needs.